Halo has made such a wonderful recovery thus far, Teresa. I'm sure will get to the point where she can once again live life on the 'wild' side. It sounds like she's really anxious to do so. Will keep my fngers crossed that happens real soon. This is the video I mentioned in my previous post. Halo is quite still, but at least you can see how well she stands and interacts with the others. Halo is the one at the back. The one in the foreground is Pippin and, in the middle, stargazing because of all the excitement, is Sammy. But in this photo you can see her standing in a plant pot, with her bad leg facing the camera, actually putting her weight on it! From nearest to furthest from the camera: Sammy, Pippin, Halo and Venus. Thanks so much for sharing the video and picture, Teresa. It is sad that all the excitement prompted Sammy's stargazing. Does she seem to recover pretty quickly when things calm down? Halo and Venus look so cute in the flower pots. Halo looks like she has a pretty good grip on that pot. Yes, I was delighted to see what a good grip Halo got on that plant pot! Her toes point to the side a bit, but she's coping very well, and teaching herself to do all the familiar movements in a slightly new way. Sammy is very fragile, she always was. The vet believed there was some brain damage in addition to the PMV, and didn't expect her to have survived this far, in fact I had been told she probably wouldn't reach adulthood. She only relaxes somewhat when she's in her cage with Pippin and nothing special is happening. Changing their food, grit or water, or changing the position of anything in her cage, brings about a seizure, although they're very short-lived. Any excitement, even positive, and the result is the same. She still walks backwards into things very often, not only that but keeps pushing backwards into objects, and her tail feathers are always getting damaged. She still needs an extra deep feeder, a gravity water dispenser where she can fit 2/3 of her beak but no more, and only has 1/4" deep bathwater. Short video of Halo exercising with Achilles. Just look at her go!!! It is heartwarming to see how these little feathered angels enjoy their life together no matter what they have been suffering. This again is for me a role model for all those days where I feel bad. These birds give us so much to think about and help us to recognize the relativity of all things. Bless their little hearts. Thank you, Cindy and Petra! You're so right, they are great role models with their courage and their determination! And seeing them succeed and get well makes the world seem a much better place! I thought she was very quiet this morning, and a bit fluffed-up, and when I examined her I found an unmistakable lesion on the roof of her mouth -- two days after she finished a full course (10 days) of preventative canker treatment with Berimax. I am SO not impressed! And guess what, I found a pigeon fly on her, despite the Ivermectin! She's on quarentine, on TMS and Flagyl, and I'm hand feeding her peas and corn, just in case she can't process the seeds properly (same as the new rescue, who's been in a separate room all along). Achilles, her mate shows no symptoms, so I wonder if the Berimax worked for him, but I'm keeping a close eye on him. He's flying, by the way, now he's almost finished moulting! Better go now, as I start work in 4 hours' time. Either the food is going through her too fast to process the (liquid) meds, or something else is at play. I'm tube feeding her formula and apple sauce, only 8-10ml at a time. The canker lesion hasn't shrunk at all. I'm taking her to the vet's tomorrow. I think she needs injectable meds. Aww, I'm so sorry about Halo, Teresa!! I don't understand how she could get canker if you were treating her?! That's a real puzzle. Maybe you can get your money back from those meds! Sending healing thoughts Halo's way. She seems like a real fighter, & I hope she recovers soon. Oh dear!! I am so sorry to hear about Halo, Teresa. Will be thinking, and sending, positive thoughts that she recovers quickly. Please let us know what the vet has to say. Thank you both so much, from Halo and from me! Unfortunately I was right, the meds were going straight through her and having little effect. Last night, after my previous post, she vomitted again and again, two days' worth of food, it seemed! I kept giving her hydrating solution and small amounts of apple sauce, and started her on Nystatin. This morning she vomitted once more, but that seemed to be the last of it. After that she was keeping her apple sauce and watery formula down, and looked a bit perkier. This morning's poops were a little more solid, with separate components, but the urates were yellowish. I took her to the vet's after lunch, when the avian vet was in. 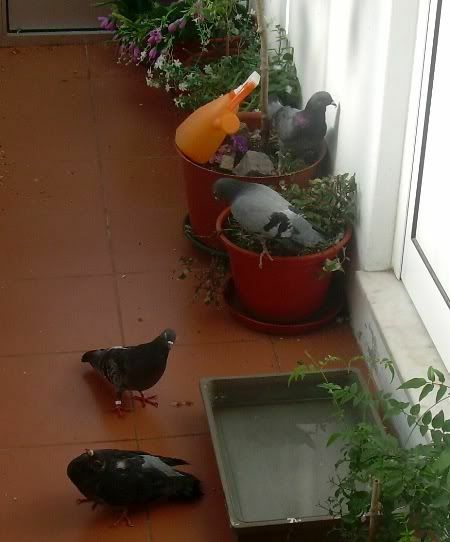 Dr. Ana Luisa is wonderful with my pigeons, so caring! She agreed it was best to switch her to injectable Baytril and give plenty of sub-q fluids, and she's continuing with the Flagyl. I was also worried about the fact she'd never laid any eggs, in spite of having a mate, and the doctor agreed to taking an abdominal X-ray. There was nothing alarming about the oviduct etc, but her liver is enlarged. She had already shown symptoms of liver/intestinal problems when I first rescued her, and she may even have been born like that, but that makes her very vulnerable and she always has to be closely monitored. The vet also took swabs, and there was clear evidence of pathogenic bacteria and fungus. It was also worrying just how much weight she lost in the last couple of days. I don't know what I would do without my vet. Even when you try to keep everything you're going to need at hand, there's always the stumbling block of needing injectable meds and fluid for birds with severe diarrhea. But she's in great hands! I'm to phone up tomorrow afternoon to see how she's progressing and when I can bring her back. PS. The Berimax is an orange and grapefruit extract, and I'm starting to wonder if it isn't simply a very expensive alternative to ACV. In this case, it totally led me into a false sense of security, in that I believed that my pigeons were protected against canker, when they weren't. I will certainly not be endorsing it as an alternative to Flagyl! I forgot to say, one of the first things the vet did was to pump her crop, to get rid of any sour liquid and food residues. Halo is coming home this evening! I'll do a proper update later. I'm so glad Halo is doing well enough to come home. Halo is back, but she's still very fragile, so weak that she keeps overbalancing. At the moment she's all puffed up in her cage (even with the heating pad), looking sleepy and miserable. She's still producing starvation poops with yellow urates. I'm quite sure that if my vet had been on holiday, she wouldn't be alive now. - Her liver is enlarged, and its function somewhat impaired. The vet said the yellow urates are related to this. - The crop wash was done with Chlorexidine, which has antifungal properties. When it was done she still had a couple of peas and corn in the crop, 2 or 3 days old. There haven't been any major changes to her meds, except that she's having Baytril instead of TMS, and she's also having an anti-emetic (Primperan) twice a day to minimise the chances of vomiting. She's carrying on with the Flagyl for a further 10 days. As for the Nystatin, we've hit a brick wall: I've only got enough for one more take, and it's out of stock at the manufacturers, even the vet can't get any. I'll have to keep scouring the smaller pharmacies, to see if by chance they have some left on the shelves, but in the meanwhile the vet said to watch her closely and take her right back if there's any repeat of the sour crop, to take a stronger fungicide. (Let's hope not, as that would be a strain on her weak liver). I've been given the green light to start giving her some small seeds, but I'm too scared they would linger in her crop. Especially because the vomiting reflex is damped by the Primperan, and any warning might come too late. So for now it's 12ml formula+apple sauce 5 times a day. * The vet is coming over here on Wednesday to inject ALL of my pigeons. Oh I forgot to add: I fully understand your disappointment about the Berimax. I know how much effort you put into getting this med. As you know I am often reluctant to use the "hard stuff" on "my" pigeons but regarding canker there is apparently no alternative to the known meds. What a shame!!! I really really hope that Halo is recovering soon after she had made such good progress with her leg. Poor little girl - get well soon again!!!! No longer fluffed up, unless she's asleep, and she even complained about being picked up for the 5th time today! I hope it wasn't just a one-off, but the last poops had cream-coloured urates, not yellow! Thank you, Cindy and Petra, for your good wishes. I'm sure that the guardian angels that look after all good little pidgies were listening! I'm so glad that Halo is doing better. Will continue with the positive thoughts. It wasn't an illusion, her urates really are much paler! Solid matter is still dark green and a bit mucousy. Last night she managed 13ml of formula, so today I tried the same again. She's had 3x13ml meals, one more to go. She can hold herself upright much better. May have to take her back to the vet's tomorrow. She's better! The crop is moving again!! !